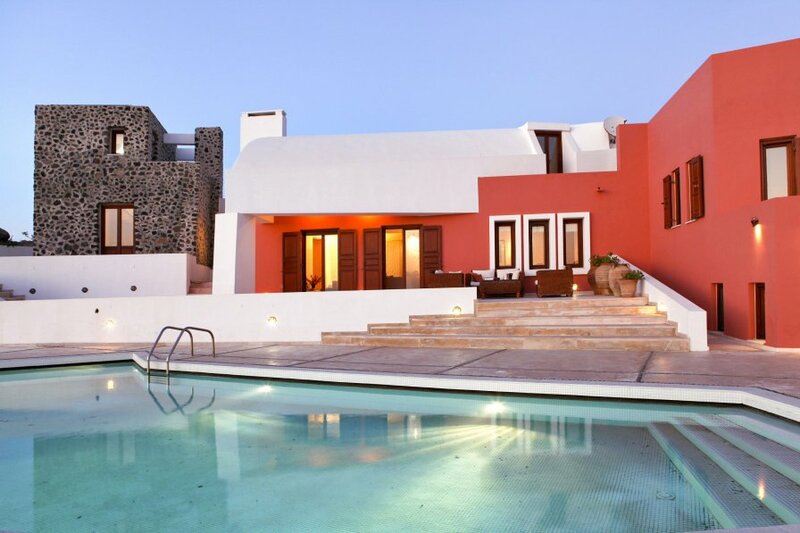 Villa Picasso has a fabulous location in the village of Imerovigli, just a five minutes' drive from the islands capital Fira which boasts a range of amenities, cosmopolitan bars and shops. The villa offers guests spectacular panoramic views of the volcano and out to sea, these views are even more impressive at sunset! The ultra-luxurious five-bedroom villa boasts stylish and comfortable interiors and furnishings which have been cleverly combined with traditional Santorinian vaulted ceilings and futuristic lines. On the ground floor is the spacious, open-plan living and dining area. Internal steps take you up to the king-size master bedroom complete with Jacuzzi bathtub and dressing room. Next-door, is a queen-size bedroom complete with en-suite bathroom. Both of these bedrooms have access to balconies which are perfect spots for enjoying the views. Further stairs lead you to a comfortable TV room with DVD and home theatre system. Also on this level is a further twin bedroom and shower room. On the lower level is a further king-size double bedroom complete with en-suite bathroom and private terrace area. The remaining twin bedroom and en-suite bathroom can be found on the basement level. The state of the art kitchen boasting all necessary modern appliances can be found at the end of the corridor, doors lead out from here to the pool area. Outside, there is a private pool and large heated Jacuzzi plunge pool which are the perfect spots from which to soak up the tranquil surroundings and enjoy the breath-taking views. The shaded pergola and outdoor table and chairs are fabulous for those who like to dine al fresco. Guests of all ages will never be bored as the villa also boasts both a giant chess board and small basketball court.